The daguerreotype, invented in France, came to America in 1839. By 1851, this early photographic method had been improved by American daguerreotypists to such a degree that it was often referred to as “the American process.” The daguerreotype—now perhaps mostly associated with stiffly posed portraits of serious-visaged nineteenth-century personages—was an extremely detailed photographic image, produced though a complicated process involving a copper plate, light-sensitive chemicals, and mercury fumes. It was, as Sarah Kate Gillespie shows in this generously illustrated history, something wholly and remarkably new: a product of science and innovative technology that resulted in a visual object. It was a hybrid, with roots in both fine art and science, and it interacted in reciprocally formative ways with fine art, science, and technology. 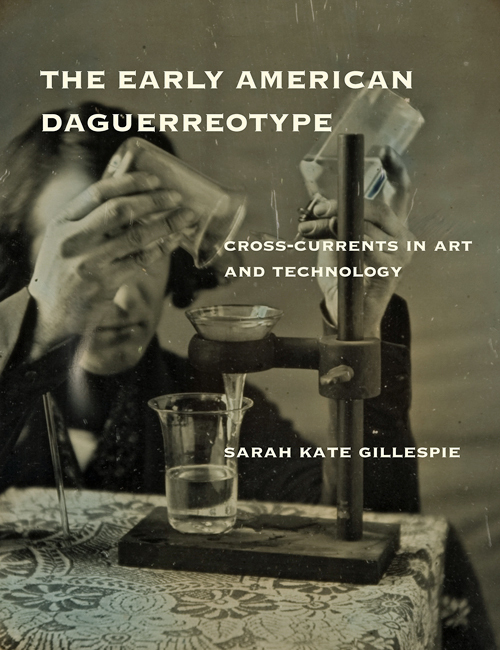 Gillespie maps the evolution of the daguerreotype, as medium and as profession, from its introduction to the ascendancy of the “American process,” tracing its relationship to other fields and the professionalization of those fields. She does so by recounting the activities of a series of American daguerreotypists, including fine artists, inventors, scientists, and mechanical tinkerers. She describes, for example, experiments undertaken by Samuel F. B. Morse as he made the transition from artist to inventor; how artists made use of the daguerreotype, both borrowing conventions from fine art and establishing new ones for a new medium; the use of the daguerreotype in various sciences, particularly astronomy; and technological innovators who drew on their work in the mechanical arts. By the 1860s, the daguerreotype had been supplanted by newer technologies. Its rise (and fall) represents an early instance of the ever-constant stream of emerging visual technologies. Sarah Kate Gillespie, a former Lemelson Center Fellow, is Curator of American Art at the Georgia Museum of Art, located at the University of Georgia. Mike Robinson demonstrates his contemporary process for creating daguerreotype portraits.